Jessica explains what’s happening with the campaign and the details of phonebanking. Monday night, April 4th, a large crowd crammed into the theater space at the OB Playhouse on Newport. They weren’t there for a stage production or music event, but were all there for Bernie Sanders. 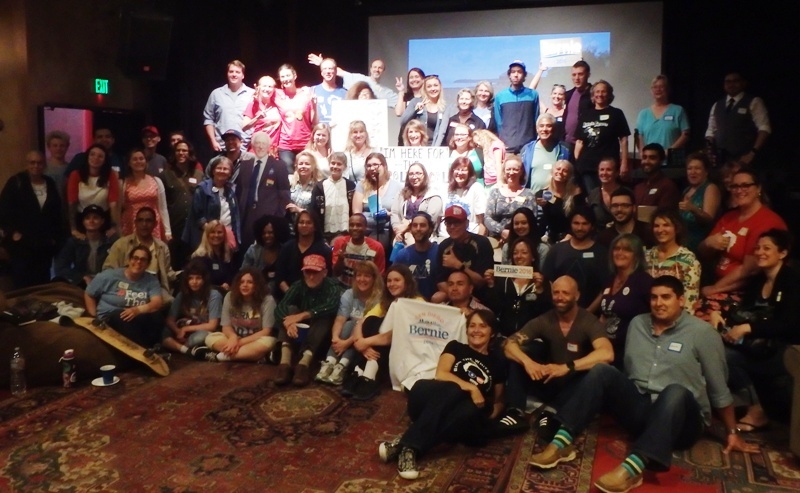 It was “barnstorming” for Bernie in OB. 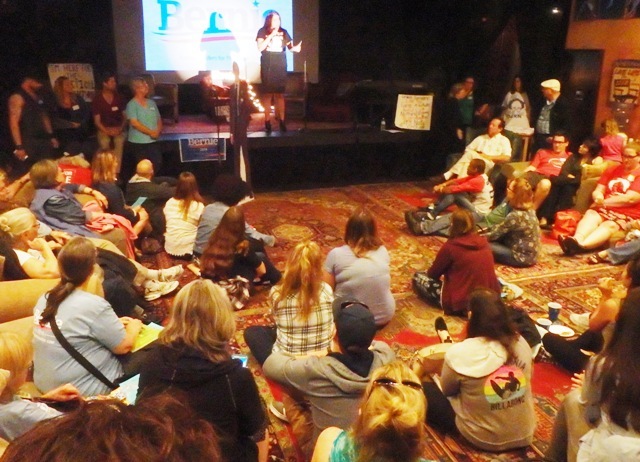 All told, I counted more than 120 human beings assembled on couches, along the back walls and on the rugs laid out on the floor, all for a workshop on the Sanders campaign. 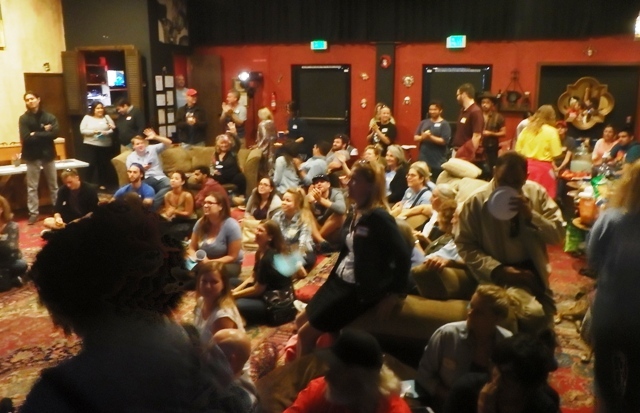 It was an event for the west wing of the campaign’s local electoral efforts on Sanders’ behalf, that included OB, Pacific Beach and Mission Beach. An attentive audience listened to the campaign updates. A woman named Jessica addressed the crowd from the stage a bit past 7pm, and the noise in the space quieted down. She thanked Stu for allowing the campaign to take over his theater. It became clear that the show was being run by women, as Jessica and several other women spoke back and forth and presented the program for the night in front of the very enthusiastic crowd. Those gathered were mostly younger people but there were some middle-aged and even older folks crowding in. There were a series of testimonials by volunteers in the campaign, explaining why they were geared up for Bernie. But the main part of the workshop, or barnstorming, was an explanation of where the campaign is now, and how they need volunteers to do phone banking. Jessica told the group about the role that Californians have played in the campaign. “California,” she said, “has made 1 out of 5 phone calls by volunteers.” Right now, the campaign is focusing on the states where the primaries are being held, and volunteers were not calling within the state. Other nuts and bolts of the campaign were addressed. It was explained that May 23rd is the deadline to register as a Democrat in order to vote in the June 7th California Primary. People can also vote in the Dem Primary as a “no party preference” independent. It was also laid out that when people vote in the Primary, they’re actually voting for caucus delegates. The date for the selection for those delegates is only a Democratic Party matter and is on May 1st, when caucuses will be held all over the state. Voters for these delegates must be registered Democrats, but people will be able to register at the site and vote. Then there was a more intense pitch to get people there to step up and join the ranks who make calls. “You’re not a telemarketer,” Jessica announced to allay anyone’s fears. She explained that the hundreds of calls being made by California volunteers help to identify potential Bernie voters, and are a huge help to in-state campaigners. 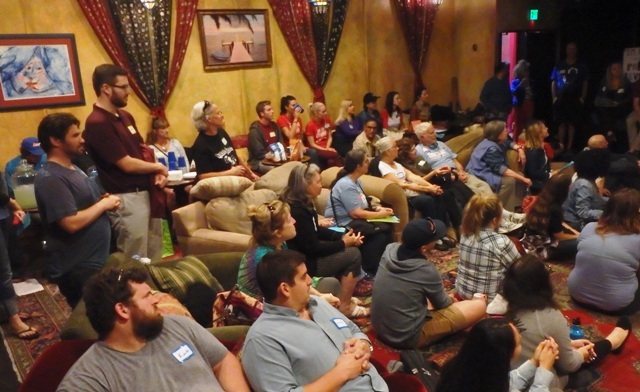 When volunteers were called for to host phonebanks, a dozen people rose and signed up. A number are being organized for Ocean Beach and Point Loma. Check the OB Rag in the near future for places, times and dates. Also go to the local San Diego Sanders campaign website. love the enthusiasm the kids (of all ages) have for their future! haven’t seem anything like it here since the 60’s.